Audience Research - Harvey Research, Inc.Harvey Research, Inc.
What’s the best way to find out about your audience and how they would like to engage with your content? Ask them! Harvey’s Custom Research division can help you better understand your audience and provides actionable data that is invaluable to both outside sales and internal content creators. We’ve been working with content publisher’s since 1953, so we understand the challenges you face and can help you succeed in today’s environment. We work closely with content publisher’s in designing complete research programs that best fit the goals and objectives of each client. 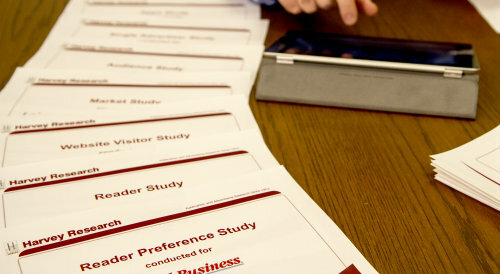 Effective and accepted audience research begins with sample selection and continues through the invitation process, survey design and programming, data integrity, data processing, cross tabulations, analysis, reporting and presentation to key stakeholders. Our highly experienced staff will work with you in custom designing a survey that best fits your needs. Once the data has been collected using our state-of-the-art survey platform we will analyze the results using cross tabs and significance testing to uncover critical insights that will help you increase engagement and grow your audience and advertising base. In short, it’s not simple and a (survey) monkey can’t do it.